Remedy had a hit on their hands when they created Max Payne back in 2001. They refined that experience with the sequel in 2003, which is still beloved by fans. 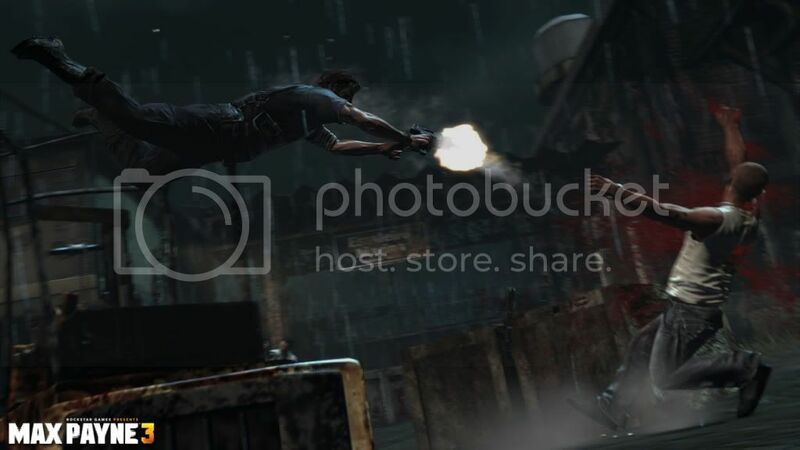 When it was revealed that one of Rockstar’s internal studios would be developing Max Payne 3 instead of Remedy, fans had concerns whether it would still feel like a Max Payne game. Does Rockstar Games have what it takes to keep Max Payne alive, or are extra painkillers needed in the latest game? Nearly a decade since the events of the previous game, Max is still tormented by his inner demons; popping painkillers and drinking his life away. After an incident resulting in the death of the local mob boss’ son, Max leaves the country and tries to begin anew working as private security for the wealthy Branco family in Brazil. Life seems good for him working this “easy” job. That is until the boss’ wife Fabiana is kidnapped by the street gang Comando Sombra. Once again, Max is pulled into another unfortunate series of events as he attempts to track down and save Fabiana. From the moment the game begins, it is readily apparent Max Payne 3 presents a serious and compelling story like its predecessors. The plot is easily darker and more serious than either of the prior games. It paints a descript picture of Max’s current life, the sort of screwed up situations that seem to follow him where ever he is, and how he begrudgingly deals with it all. As the story unfolds, it captures your attention with numerous twists and unveiled conspiracies that compel Max to continue on. This is easily some great writing, and is some of the best in the series. Also as before, Max provides inner monologues during the game that provide insight to his thoughts. He is as cynical as ever, which is understandable given everything he has gone through and how everyone he cared for ends up dead. Even when he interacts with other characters, he carries a grimly sarcastic tone where part of him no longer gives a damn. You really feel and emphasize with his nearly constant state of misery, and hope for some glimmer of light at the end of it all. 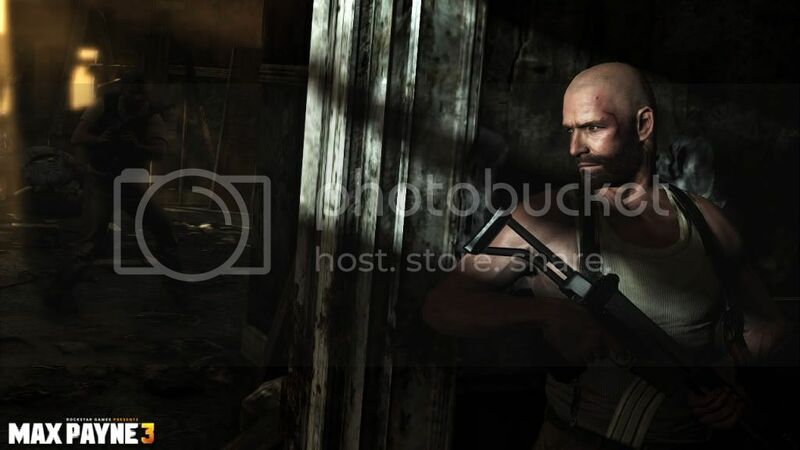 In line with the series’ history, Max Payne 3 has a very cinematic presentation that permeates the entire experience. While it no longer uses graphic novel format of before, Rockstar has taken a more modernized approach with the frequent use of split screens that give off a similar feel. Also in line with Max’s consistent state of either intoxication or painkiller high, the game utilizes blurring and afterimage effects very frequently to give you a sense of how Max views the world. It can be rather jarring at first, but it is used frequently enough that you will grow accustomed to it. More notably, game play and story scenes are seamlessly integrated together in a way that is reminiscent of Naughty Dog’s Uncharted series. The game flows from one moment to the next without a hitch and you are never taken out of the moment with a single loading screen. A minor point to make is that cutscenes occur rather frequently, and once one starts you usually cannot skip it nor do anything except pause until the game puts you back in full control. Regardless, Max Payne 3 flows at a constant pace, and compels the player to keep playing to find what happens next. Aside from a strong narrative and presentation, a game is nothing without compelling game play to back it, and Max Payne 3 does not disappoint in this regard. The shooting and controls are as responsive as ever, and killing foes is just as satisfying. Adding to that satisfaction is how the last kill of every battle is accentuated by a slow motion kill cam that follows the lethal shot leaving Max’s gun and hitting its mark. These kill cams are especially brutal in how it shows exactly where the shot lands and the damage it causes. Make a desperate dive at someone with only a few rounds left in your clip and watch as the magic bullet nails him through the eye, or witness the buckshot of your shotgun eviscerate a soldier’s face. Even performing melee kills is fun and brutal as you watch Max disarm an enemy and execute him with a shot between the eyes. Of course, it would not be a Max Payne game without bullet time, the slow motion mechanic that sets the series apart from other shooters. Bullet time makes its glorious return albeit in modified fashion. Time still slows down for everyone, but you are still able to aim in real time which provides an advantage over foes. The gauge that regulates it still refills with kills, but only when it is not in active use. Also, it no longer recharges itself outside of fights as it did in Max Payne 2. With all of these changes, you may find yourself not using bullet time as much as the previous games. However, there are other supporting game mechanics that supplement bullet time. Max is still able to perform a diving shoot dodge. During a shoot dodge, bullet time goes into effect until Max lands on the ground or collides with an object in the environment. It is able to be used anytime even when the bullet time gauge is empty. Diving through the air and killing a handful of enemies in the process is still fun and stylish. However, you cannot randomly dive around and expect to clear an entire area as Max is vulnerable when he is getting back up to his feet after a dive. In addition, there is a new cover system implemented into Max Payne 3 that is very basic in functionality. Max gets behind an object and keeps his head low, allowing you to briefly catch your breath during a firefight. There is no option to easily transition from one object to another that is close by outside of a shoot dodge. The limited movement options while in cover will keep you from trying to solely play it like a cover-based shooter. It becomes a balancing act utilizing these three primary aspects to survive each encounter as each enemy is capable of killing Max in seconds. Use bullet time to kill some enemies while positioning yourself, shoot dodge to get behind some cover while getting more kills, and use cover to protect yourself as you kill some more to recharge bullet time. Balancing each aspect keeps every fight tense and exciting as over-reliance of one can and will lead to death. Even if you screw up and take a lethal shot, there is the last stand mechanic to help you if you are still holding a painkiller. Bullet time activates as you fall and gives you a chance to take out the enemy who wounded you. If successful, you use up that painkiller and survive lying on the ground ready to keep moving. It is incredibly useful for those times you get shot by someone you did not even see coming. When it comes to weapons of destruction, Max Payne 3 provides a modest selection of guns. There is still the usual assortment of pistols, submachine guns, and rifles; sadly, grenades and molotov cocktails are out. It is a shame since the game has scenarios with large numbers of enemies where they would have been incredibly useful. Also, it would have been even more satisfying to see a kill cam for someone lit up like a bon fire. Thankfully for the weapons that are in the game, there is still plenty of ammo; so you can be a bit trigger happy without much penalty. Unlike the previous games, Max can only carry up to three weapons on him: two handguns and one two-handed rifle/shotgun. One thing that is neat is the details of how he wields guns. If you are holding a rifle and switch to a pistol, he will continue to hold the rifle in his off hand; switch to dual wielding handguns and he will drop the rifle entirely. This more realistic approach will make you carefully consider what you want to carry with you. One really obnoxious thing with weapons that occurs frequently is that during a cutscene Max will pull out one of the handguns he has on hand. If you were using one of the more powerful two-handed weapons before the cutscene, you will find yourself equipped with the handgun afterward. You then have to fumble with reequipping yourself with what you had prior. This happens far too often, and in many cases becomes a burden as you are under attack shortly after you regain control. 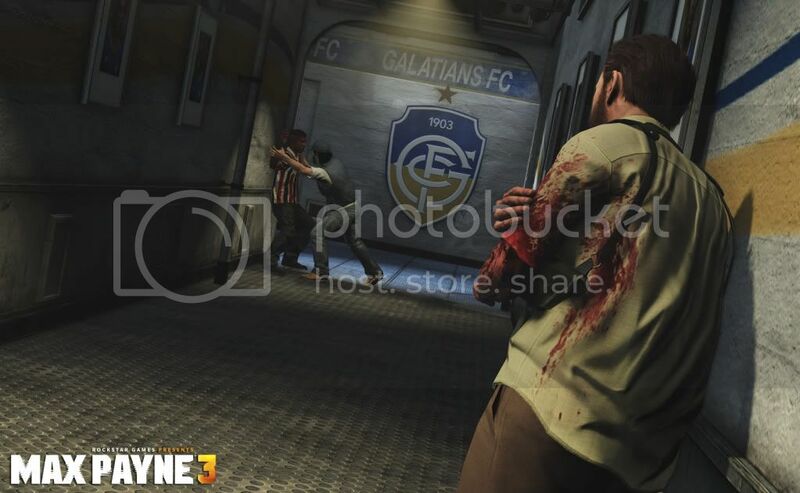 Throughout the entirety of the single player experience, Max Payne 3 keeps varying up its environments and set pieces for shooting lots of people. Just when you may get tired of one area, it transitions the story to another part which keeps the experience consistently fresh and exciting. There are even specific moments where Max is in a predicament like falling out of a VIP lounge or riding a zip line toward a group of foes where bullet time automatically kicks in, and he has to take out most if not everyone in the vicinity. These are easily some of the most memorable and exciting moments in the game, and will make your jaw drop at the stunts you get to pull off. Rockstar has always made it a craft of making worlds that feel alive, and they keep up their reputation in Max Payne 3. Whether in a busy nightclub, in the rundown Brazilian favela, or some backend bar in New Jersey, each part of Max Payne is incredibly detailed and feels like a part of a fleshed out world. The Brazilian population obviously do not speak English, and certainly make Max and you feel out of place as a foreigner in their land. There are also objects laying about the world that Max can look at and he will comment on its relevance to the current situation or the overall plot. The world and the current plot at hand have this cohesive feel that is common of a Rockstar developed game. Once you are finished with the main campaign, there are plenty of options available for replaying the game. There is the typical assortment of difficulty levels to put your skills to the test if the default difficulties were not trying enough. There is a score attack mode where you play through the campaign trying to rack up high scores. The series staple New York Minute is back, though it functions like the first game where you start with 60 seconds on the clock, you gain extra time for kills, and you die if the timer hits zero. It is still a frantic, exhilarating experience trying to keep that clock up as you progress through each level. 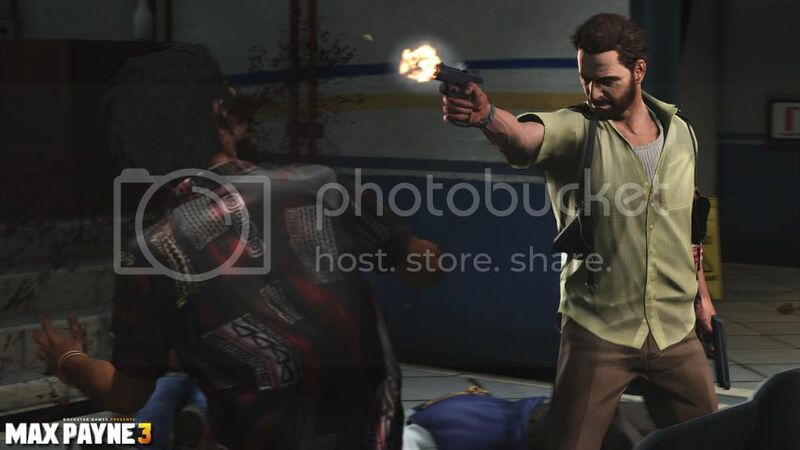 Max Payne 3 also has a fully featured online multiplayer suite to mess around with. For the most part it contains most of the things you see often in modern multiplayer games. Automated matchmaking system based on game types: check. Level progression system for unlocking weapons and customizations: check. In terms of game types available, aside from the traditional deathmatch and team deathmatch there are two other types that are somewhat different. First there is Payne Killer where the first players to kill or be killed become Max and his partner Passos, and they must try to kill the other players to earn points before dying. Every one else is gunning for Max and Passos in order to become one of them. It is an interesting mix of team-based play with juggernaut. The other unique game type is Gang Wars. This mode is completely team-oriented as it very loosely puts together a story setting that pits each team against each other in a series of five rounds. Each round is a different game type, and is dictated by the results of previous rounds. If one team dominates the majority of the first four rounds, they will get some sort of advantage during the final round. The set up for Gang Wars is interesting, but ultimately does not feel quite as varied of an experience as it sounds. For the most part, it just feels like a long set of games tied together. Bullet time is featured in multiplayer, but it is implemented in a way that is does not make it broken. Whenever someone initiates bullet time, it affects not just the person using it, but also anyone who is in the vicinity. What this means is that your own bullet time can be used against you if you are not careful. It also feels rather silly when you are moving through a map, and you see the time slowing effect of bullet time even though you can not see anyone near by. 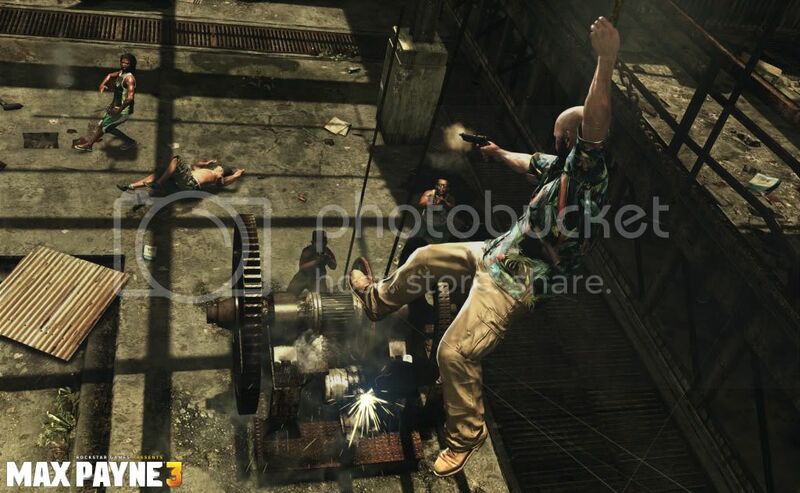 Max Payne 3 most certainly lives up to expectations and features the total package of a fun and exciting game. The story and presentation is top notch work and holds dear the cinematic feel of the series along with a detailed, believable world. With the new kill cams, executions, and bullet time moments, gun fights are incredibly rewarding and so fun that it may make you second guess the stunts you are pulling off. 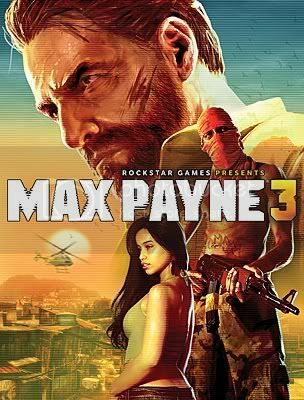 While there are a few minor issues like weapons changing during cutscenes and the multiplayer offering a modest experience that is not too different than the norm, Rockstar Games has made Max Payne 3 is a worthy sequel to Remedy’s previous works and is worth your time to pick up and play.